My team at Google began with a bold mission: Change the way the world learns and make education accessible to all. 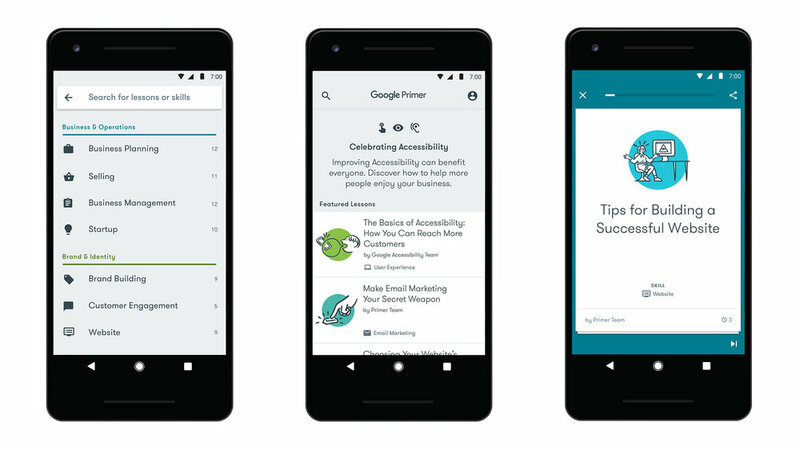 So we created Primer—a free mobile app with fun, 5-minute, jargon-free, interactive lessons that help anyone start their own business and quickly get up-to-speed on digital marketing. I was a core member of the original team who concepted, built, and launched the MVP version of Primer and Primer 1.0, and I currently oversee lesson creation, content strategy, and UX writing for updates and new releases of Primer. This includes Primer's international expansion with launches in Canada, India, Indonesia, Brazil, and Spanish-speaking Latin America. Define and own the distinctive Primer tone of voice and personality, brand positioning, and content strategy. Manage Primer's content team, which includes a content strategist and producer, junior and senior writers, and illustrators. Provide creative direction for writers and designers. Have written 75+ lessons and overseen the creation and launch of 180+ lessons (and counting). Partner with designers and product marketing managers to produce advertising and website concepts. Ghostwrite articles and blog posts as part of Primer's content marketing strategy. Assume an editorial role for all articles, press releases, and online posts released by the Primer team.